I’m using my 2017 Eccles British Library Writer’s Award to research and write my second novel, Catspaw, which follows two women from Chicago to the Sierra foothills during the California Gold Rush. Women are largely excluded from the mythic-historic narrative of the Gold Rush. Those that do appear are marginal, stereotypical characters: the long-suffering, godly pioneer mother (Sarah Royce), or the savvy prostitute (Belle Cora). I want to tell a story of two women who don’t conform to these stereotypes. Women were in the minority in the 1849 migration west; but they were there, and they encountered difficulties and opportunities that were unimaginable back east. I wanted to understand the experiences of these women in their own words. Sarah Royce’s renowned memoir, A Frontier Lady (New Haven: Yale University Press, 1932; shelfmark 010409.ee.40) left me with more questions than answers. Written at the urging of her philosopher son Josiah Royce, it tells the story he wanted her to tell—one of Christian fortitude as foundational to California. It left me wondering how she really felt as she left Iowa with her somewhat hapless husband and toddler daughter, bound for the unknown. John Irving wrote that "all memoir is fiction"; but I wanted to read female first-hand accounts that weren’t so starkly in service of a higher narrative. The Eccles Centre’s bibliographical guide, Women in the Trans-Mississippi West, 1840-1900 (London: British Library, 1999; shelfmark YC.2000.a.575 ), helped me locate these accounts. From the letters of the outspoken Mary Jane Megquier, with her longing for "a line" from home and her good-natured complaints of "jiggers in [her] feet, a small insect that lays its eggs in your flesh"; to the witty journal of Helen Carpenter ("there is nothing in sight to merit the name Rocky Mountains—no rocks"); to the letters of Louise Clappe, with her sheer enchantment with "this solemnly beautiful wilderness"—these first-hand accounts are invaluable in helping me develop the voices of my female protagonists. I can’t imagine writing my novel without them. Kevan Manwaring is an Eccles Centre Postgraduate Fellow and a Fellow of the Higher Education Academy. He is currently undertaking a Creative Writing PhD at the University of Leicester. His practice-based research is a novel set in Appalachia & Scotland. As an historical artifact and as a cultural meme I set out to explore the phenomenon of that quintessential icon of American pioneering spirit, the log cabin. Lincoln Log Cabin State Historic Site. Photograph by Daniel Schwen [CC BY-SA 4.0 (http://creativecommons.org/licenses/by-sa/4.0)], via Wikimedia Commons. The homely shack hacked out of the primal wilderness, or so the myth goes, the log-cabin has been called ‘a symbol of democracy’ (Shurtleff: 5). Synonymous with self-reliance, hard-work, and grit the cabin has a taken on a metaphorical dimension. How has it become the crucible of the American Creation Myth? Every state seems to have at least one of these iconic structures where their most famous son or daughter started out. Perhaps the most hallowed of these was at Walden Pond, in Massachusetts, where, on the 4th July, 1845, Henry David Thoreau went to build a cabin. And live there he did, for a couple of years, cultivating his legumes and legend; but the nature of his dwelling – now enshrined in American culture and replicated countless times across the nation – is not exactly what it seems. It needs interrogating and deconstructing somewhat – but not to undermine Thoreau’s achievement or legacy – but to examine the foundations of this most enduring and beloved icon. This ‘log-cabin myth’ (as Harold R. Shurtleff defined it in his 1939 Study of the Early Dwellings of the English Colonists in North America) is ‘an American belief that is both deep-seated and tenacious’ (Shurtleff: 5). Let us look at the history of the Log-Cabin. At the risk of seeming disingenuous, I think it’s necessary to remind ourselves of what a log cabin is defined as: ‘a small house made from tree trunks’ (Cambridge Dictionary online). This is important, especially when considering Walden (it was not). It is a term that is often bandied about and misapplied. But when was the log cabin first seen in the New World? From current evidence we can deduce that the first dwellings built of round or square logs was raised by the earliest Scandinavian settlers in 1638 – primarily Swedes, but also Eastern Finnish, bringing with them the skill-set of the Savo-Karelian culture (Jordan; Kaups, 1992). German immigrants constructed their own variants, independently, from about 1710. The Scots-Irish arriving in large numbers after 1718, took up this new opportunity (having been unable to build timber-houses at home due to the lingering restrictions of that Norman construct, ‘forest’, and the financial cost) and ran with it. It seems likely they invented the term ‘log cabin’ (one belonging to a James McGavock is identified in an Irish community, Virginia, 1770). Before that, the most common one was ‘log house’ (Maine, 1662; Maryland, 1669; Massachusetts, 1678; North Carolina, 1680; New Hampshire, 1699). Via this new wave of migrants, the log cabin went ‘viral’: ‘From and through the Germans and Scotch-Irish it spread rapidly through the English colonies and by the American Revolution had become the typical American frontier dwelling from Maine to Tennessee.’ (Shurtleff: 4), to the point that, as John Alexander Williams observed: ‘The log house is the most enduring symbol of Appalachia’ (2002: 5). Cheap, convenient and quick to construct from readily available materials, with only an axe, a pair of hands, a mouthful of nails, some cussing and a lot of elbow grease, it is small wonder the log cabin or house flourished. In summary it seems likely, that whoever got there first (and the degradable nature of the material means we will never know for certain), that ‘each group of European colonist in the seventeenth century erected the sort of dwellings they were accustomed to at home.’ (Shurtleff, 209). Yet were they bringing coals to Newcastle, for it is noted by William Byrd in 1728 how he found ‘Indians’ in Virginia and North Carolina in the traditional lodges of their ancestors, what he called ‘Bark Cabanes’, wooden dwellings. This suggests the possibility of cross-fertilisation – that the ‘log cabin’ was the product of syncretism. And so we can see how the notion of the ‘log-cabin’ is a constructed one, one with several influences. As a metaphor for the quintessential hybridity and Old/New World recycling of America, it is fit-for-purpose. A seminal example of this is the ‘Lincoln Log Cabin’ – the humble family home of the 16th President of the USA. At Knob Creek Farm, La Rue County, Kentucky, a neighbour’s farm was relocated to the approximate spot and turned into a heritage ‘shrine’, evidence of the Lincoln myth, and by extension, the dramatic arc of the American dream – from log cabin to the white-house. Such ‘repackaging’ has precedent, which can be seen if we dial-back to the 14th Presidential Election Campaign. In what became known as the Log Cabin campaign of William Henry Harrison, we can see the repurposing of the log cabin for political capital. Evoking an American Arcadia, the log cabin symbolized a return to good, simple virtues, to an uncomplicated, uncorrupted way of life. We see this representation of the log-cabin in classics of American literature such as Uncle Tom’s Cabin, Harriet Beecher Stowe’s 1852 reformist novel; Mark Twain’s Adventures of Huckleberry Finn (1884); Thomas Wolfe’s Look Homeward Angel! (1929); the ‘Little House’ books of Laura Ingalls Wilder (1932-1943); Woody Guthrie’s recently rediscovered House of Earth (1947); Wilma Dykeman’s Appalachian trilogy, The Tall Woman (1962); The Far Family (1966); Return the Innocent Earth (1973); and Charles Frazier’s Cold Mountain (1997). These and many others create a sub-genre of what could be called ‘Log Lit’. Extending its influence far beyond Appalachia, the log-cabin offers us a place of renewal, a taste of a more authentic, embodied, embedded and sustainable life. Grant, Richard E., Ghost Riders: travels with American nomads, London: Abacus, 2003. Jordan, Terry G. & Matti E. Kaups, The American Backwoods Frontier: an ethical and ecological interpretation (creating the North American Landscape), John Hopkins University Press, 1992. Detail from: Giovanni Battista Ramusio, “La Nuova Francia,” Delle Navigatione et Viaggi, 1556. BL 566.k.3. On the twentieth of April 1534, Jacques Cartier sailed from St. Malo, France, with two ships and sixty-one men aboard each. On the tenth of May they came to Newfoundland at Cape Bonavista. On the twenty-first of May they sailed Northeast until they came upon an island encompassed by a jumble of broken ice which Cartier named l’Isle des Ouaisseaulx (Isle of Birds), as its surface was covered with nesting sea birds and the cries of thousands more filled the air overhead. Many sixteenth-century maps show some variation of an Isle of Birds off the Northeast coast of Newfoundland. 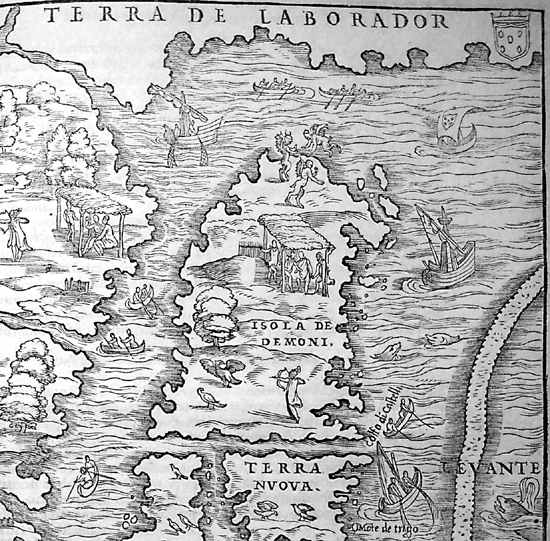 In a map of 1555, the French privateer, explorer, and navigator Guillaume le Testu calls an island in this region I. Puanto (Stinking Island), in reference to the evil odour of the guano of the millions of large sea birds accumulated over centuries. Until the 1800s, English maps commonly showed an Isle of Penguin. 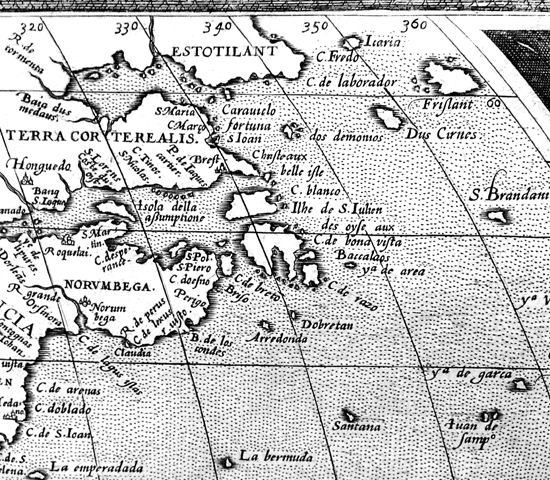 The narrator of Sir Humphrey Gilbert’s 1583 voyage for the colonisation of Newfoundland for England remarks: “We had sight of an island named Penguin, of a fowl there breeding in abundance, almost incredible, which cannot fly, their wings not able to carry their body, being very large… and exceedingly fat” (Hakluyt). The narrator is not confusing the Great Auk with the large flightless bird of the southern hemisphere. Quite the contrary. According to the Oxford English Dictionary, the word ‘penguin’ is of Welsh origin, from pen gwyn meaning ‘white head,’ and refers to the Great Auk, which once nested in the thousands on the islands off Newfoundland. It would be another 250 years before humans of any nationality would set foot on Antarctica. By the time they arrived, the Great Auk had been hunted out of existence. The southern bird we now know as Penguin is haunted by the ghost of its northern namesake. Modern maps show an island called Funk off the Northeast coast of Newfoundland. A scrap of a place, this small, barren island is home to an ecological reserve and remains populated exclusively by birds. The name Funk is redolent of the evil odour of guano. Would Funk Island by any other name smell as fowl? Since the first European voyages to the rich cod-fishing grounds off Newfoundland there have been also been reports of an Island of Demons in the region, reputedly inhabited by a curious mixture of wild animals, mythological creatures, evil spirits, devils, and demons. An inscription on the second oldest known printed map depicting the new world, published by Johannes Ruysch in Rome in 1507, notes: “Demons assaulted ships near these islands, which were avoided, but not without peril.” On the first printed map devoted exclusively to New England and New France, published by Giovanni Battista Ramusio in Venice in 1556 (pictured above), an Isola de Demoni is populated by curious combination of seabirds, hunters, natives, and winged devils of whom Ramusio makes no direct textual mention, observing only: “Between Ras Cape and Brettoni Cape lives severe and cruel people with whom it is impossible to speak.” An island of demons appears on the famous Flemish geographer and cartographer Gerardus Mercator’s world map of 1569. An isle des oyse aus (Island of Birds) and an isle dos demonios (Island of Demons) appear in the equally famous Flemish cartographer Abraham Ortelius’ 1569 map of the new world (pictured below). Detail from: Abraham Ortelius, Americae Sive Novi Orbis Nova Descriptio, 1569. BL Maps C.2.c.1. 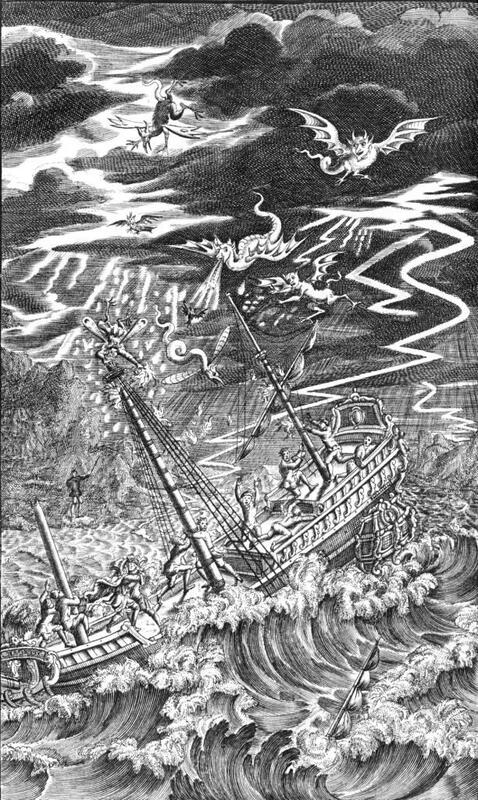 Frontispiece of the opening scene of The Tempest from Nicolas Rowe’s 1709 edition of Shakespeare’s plays. Source. it was a pity to hear the ravages which those evil spirits made around them and how they tried to destroy their little dwelling, appearing as divers kinds and shapes of frightful animals… at night they often heard such loud cries that it seemed as if there were more than 100,000 men together (Schlesinger & Stabler 1986: 64). The sound of voices figures prominently in Thevet’s published account of Marguerite’s orally recounted ordeal. These sounds locate this narrative within one the most advanced communications network of the day, that of shipping. Sixteenth-century sailing ships were small, fragile by twenty-first century standards. Transatlantic expeditions were timed to avoid the worst of the seasonal flows of icebergs in the North Atlantic, to arrive after the breakup of the thick pack ice in the Strait of Belle Isle. After many weeks on the open ocean, arrival at Newfoundland coincided with thick fogs coming off the warming continent, and with the breading season of the great flocks of seabirds that inhabit the coastal cliffs and off-shore islands. When mating, Great Auks utter utterly demonic sounds, low moans and guttural growls. Considered in this context, the Isle Demons assumes a more tangible form. Passing pilots and mariners were plagued, not by the human voices of 100,000 men but rather, by the moans and growls of thousands of mating sea birds. Among the strange beasts Marguerite encountered were walruses and snow white polar bears. Among the evil spirits – salt mists, sea frets, sleet, snow, gale-force winds, and the stink of centuries-worth of gauno. Detail from Odysseus and the Sirens, an Attic red-figured vase from 480-470 BC. British Museum. Image source. Though it is almost certainly from a malodorous genealogy that the name of the modern-day Funk Island descends, it is interesting to note that in German, the word ‘funk’ means radio or wireless. This false genealogy, with its association with sound and broadcast, resonates with the Greek myth of the Isle of Sirens. 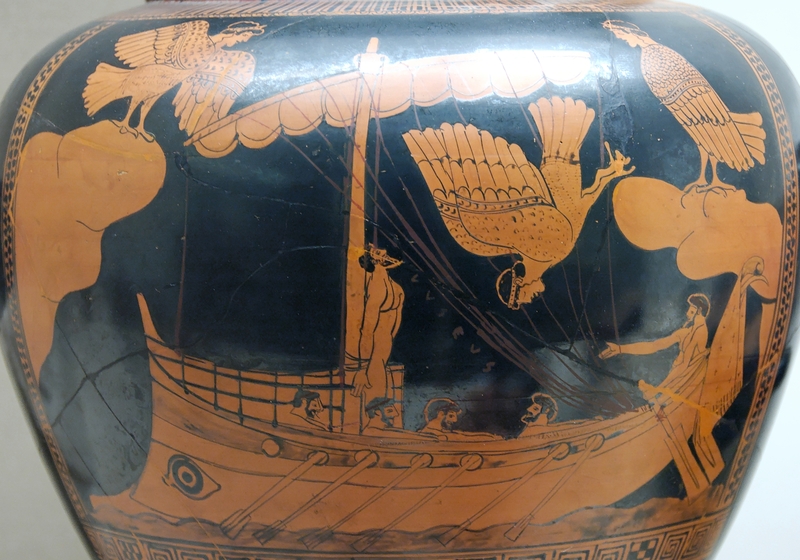 The winged creatures depicted tormenting the ship of Odysseus on the Attic vase pictured above date from over 2000 years before the winged devils shown on Ramusio’s map. In Classical times the perils of sea travel rationalised by the invention of dangerous beautiful creatures who lured passing sailors with their enchanting music and voices to shipwreck on the rocky coast of their island. In the early sixteenth-century, the Island of Demons was born of a similar necessity. Where better to place the fears, desires, rumours, and superstitions of an Early Modern Europe than on a phantom island hovering just offshore of this strange new world? Above: Daniel Patrick Moynihan. Image from Wikipedia. Earlier in the summer, I had the pleasure of spending two weeks at the British Library as part of an Eccles Centre Postgraduate Research Fellowship Award. In a fortnight filled with record heat waves and unavoidable tube strikes, I was able to make substantial progress on a thesis chapter based on my findings at the library. The wealth of material available is beyond compare, and as this post will highlight, use of the newspaper archives, particularly the New York Times, enabled me to strengthen my argument considerably. I am a current third-year Ph.D. student based in the Department of History at the University of Glasgow. My thesis questions the notion of conservative ascendancy and the so-called ‘Reagan revolution’ in 1980s America by reinterpreting the impact of liberalism at the time. In order to do so, a section of it focuses on Senator Daniel Patrick Moynihan (D-NY. ), a liberal champion and vocal critic of the Reagan administration. From an examination of my initial research, completed whilst a 2014 John W. Kluge fellow at the Library of Congress, it became clear that Moynihan played a crucial role in protecting liberalism’s brightest jewel, Social Security, from conservative dissection. With a case study titled ‘Social Security and the 1982 Midterms’, I sought to use the collections at the British Library to show how and why a strong liberal defence of Social Security in the early 1980s, driven by Moynihan in the Senate and supplemented by the activism of liberal interest groups, dissuaded the Reagan administration from attempting major revisions and had a dramatic impact on the 1982 midterms. ‘Remember that the victorious party was not pledged to any radical disruptions of social programs of the kind now being proposed’ Moynihan wrote. Yet ‘one economist after another and, in the end, decisively, Wall Street, offered the view that there was no way that a one-third tax cut could pay for itself.’ As Moynihan shows, ‘one year ago, the President's campaign rhetoric was still full of wishful thinking about major tax cuts without any reductions in Government spending. Despite all of this early supply-side hyperbole, the President's actual program represents a total repudiation of the naive Laffer curve theory that across-the-board tax cuts are self-financing.’ With Moynihan leading the charge against Reagan for the rest of the decade, as David Stockman, Reagan’s first budget director, would later lament in his memoirs, the May 1981 showdown in Congress was the beginning of the end for the Reagan Revolution. Above: Reagan addresses Congress on the Program to Economic Recovery (April 28th, 1981). Image from Wikipedia.